The two most common questions we are asked at beercans.org are: "What is this particular can worth?" and "Is there any value to the beer cans that I collected twenty years ago?". It would be nearly impossible to list the literally tens of thousands of different beer cans that have ever been produced. We have attempted to create a table of several general categories of cans based on age and type. For each category we give a typical price and along with a percentage of cans that fit into the typical category. We also give the percentage of cans that are the exception to the typical and the price range. These prices reflect the value for the sale of an individual can. When an entire collection is sold, the price is usually considerably less than the sum of the individual cans. This reflects the effort involved with finding buyers for potentially hundreds of individual cans. Cans in less than good condition with scratches, water spotting, and even rust drop off in value very quickly. Like virtually all collectibles, condition is a key factor in determining value. We hope these tables will present a general idea of can values. Typical 99% 0.25-0.50 These cans are fun to collect but they do not have that much value. Most experienced collectors have run out of room for new cans. These are still popular with beginners and with the collector who only saves the personally emptied cans. Exception	 1% $1-$5 A number of brewers currently produce canned beer solely for export. These cans are never sold in America and instead end up in places like South America and Asia. The Penthouse can sold in Japan is an example. Harley Davidson cans are the rare example a current can that is still popular. They have been produced since 1985 and command $1 or $2 apiece. The political cans such as Billary and Boss Ross are another exception. Typical 99% 0.25-0.50 These cans were produced during the peak of the beer can collecting hobby. Therefore many, many were saved resulting in their low value today. Many of the newer steel cans are identified because of the crimping at the top of the can. This refers to the fact the the with of the can tapers near the top to reduce the size of the aluminum top. There are also two piece steel cans where the bottom and side have been fabricated from one piece of steel. On the positive side, the older three piece cans have better graphics than aluminum cans. There are also cans from this era from a number of now obsolete breweries. The Billy can is a good example from this era. Exception	 1% $1-$3 There were a few interesting sets of cans produced during the period. Examples are the Schmidt scenes from Heileman, Olde Frothingslosh from Pittsburgh Brewing, and the 18 can American Historical Brewery set from Huber. There were also a number of cans produced during the period targeted specifically at beer can collectors. These cans were produced in very small quantities but a very large percentage were saved by those same collectors. At right is one example of the Sugar and Spice set of nine cans produced by Schell of New Ulm, MN. Typical 95% $0.25-$2.00 The older style pull tabs were produced starting in 1962. They can be distiguished from the newer pull tabs by the fact that they are always three piece cans (top, bottom, and side) and they are not crimped at the top. These are often called straight steel cans by collectors. A great many of these cans were also saved by collectors in the 1970's so there is still a good supply and not a large demand for the more common of these cans. These cans are still very attractive especially when compared to modern cans. The Holiday Bock can from Potosi is a good example. Exception	 5% $2-$200 or more There were a number of pull tabs produced in the 1960's before the can collecting hobby took off. As a result they are somewhat rarer. The Tiger beer from Jackson Brewing of New Orleans is a good example. It was produced near the home of the LSU Tigers and is worth over $50 in good shape. The Jaguar from Rochester Brewing is a colorful can that usually goes for over $30. The most famous valuable can is the James Bond 007 brew from National Brewing of Phoenix, AZ. This can was produced in limited quantities and is highly desirable because it has the combination of rarity, good graphics including women and London scenes, being part of a seven can set, and of course the Bond name. These go for over $200. Typical 90% $3.00-$30.00 Flat top cans are those requiring a can opener to open the can. They were ultimately replaced by the pull tab can in the mid 1960's. Flat top cans are still very appealing to collectors who tend to focus on older cans as they run out of space. Cans produced after 1950 were not required to have the Internal Revenue Tax Paid words on the can. The government still collects their taxes but after 1950 the breweries were not forced to remind us of the fact. It was during this period that the 16 ounce and 8 ounce cans started to be produced. Budweiser cans were produced in large quantities and therefore are relatively inexpensive. Rainier of Seattle and Spokane produced literally hundred of different cans in their jubilee series which often sell for around $40-$50 in good shape. Exception	 10% $30-$500 or more There are many more tough cans in the flat top category. This reflects the fact that there were many more smaller breweries in operation during this period. They often just served their local communities and therefore produced far fewer cans. A couple of interesting examples include the White Bear from White Bear of Eau Claire, WS and the Mr. Lager from Fox Head of Waukesha, WS. Typical 75% $20 - $100 The oldest flat tops were produced starting in 1935. A can posessing the phrase Internal Revenue Tax Paid is almost certainly a pre-1950 can. These earliest cans typically had opening instructions on the back of the can. Consumers were introduced to the can opener. WWII era cans are typically in olive drab and were packaged specifically for overseas troops. The Ballantine is likely the most common example of an olive drab can. Exception	 25% $100 - $1000 or more The toughest old cans tend to be from defunct small breweries. There were many small breweries that started up at the end of prohibition. Many of these did not last much more than five years. It is a very rare exceptional can that hits the $1000 mark. The higher prices in this category reflects the fact that it is very difficult for these older cans to survive the 60-65 years in good shape. These very old cans really do look old. The BEER and ALE tend to be in very large letters to announce that some of these cans such as the Kings Ale shown here are amongst the first to be packaged in cans. Typical 75% $25-$100 The cone top can was introduced around the same time as the flat top can back in 1935. The original advantage of being compatible with bottling lines and requiring the familiar bottle opener soon disappeared. So too did the cone top can. Only one brewery, Kessler of Montana, produced the can as of 1960. Schlitz was the most prolific producer of the cone top cans. 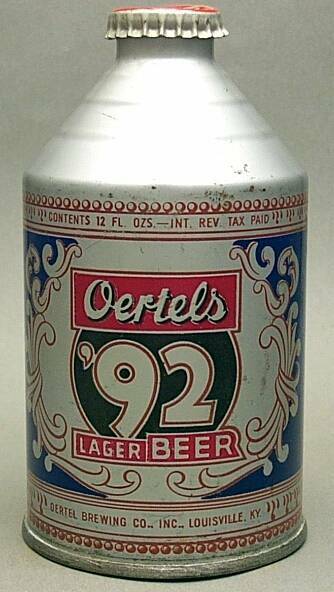 The Oertel 92 can from Louisville, KY is and example of a crowntainer. These two piece crowncontainers could never match the quality of graphics seen on the flat top can. The Pabst can is an example of a quart conetop. Exception	 25% $100-$1000 or more The rare old conetops may be the most popular of all beer cans. The Old Missouri can from Chicago is an example of a tough quart conetop. 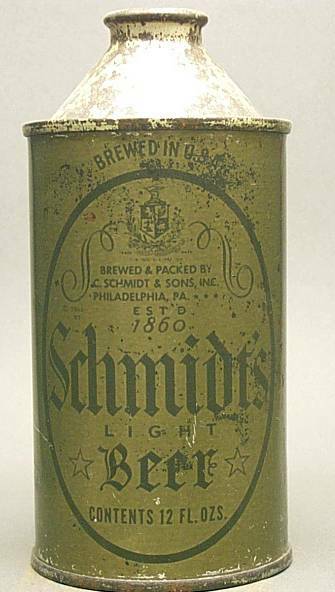 This Schmidt's olive drab cone was actually found in Austria, far away from the brewery in Philadelphia. 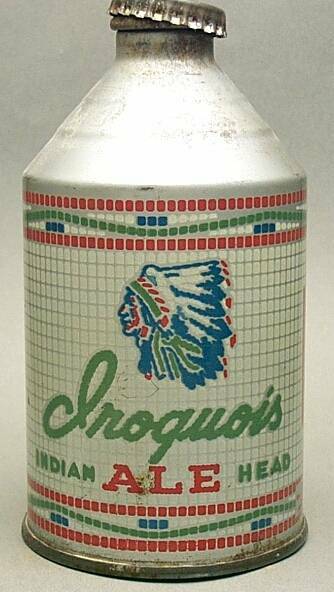 The Iroquois Ale is from Buffalo. Only the rarest of cones reach the $1000 plateau.